With the opening of the new SunTrust Park Stadium across the interstate, there has been growing concern about parking availability. While we still encourage folks to carpool, there should be ample space available for parking on site. Additionally, there are some other commute alternatives available you may want to consider. Parking at the hotel is free, but limited. Arrive early for your best chance at snagging a primo space. If you’re not familiar with the area, you should know that the Renaissance Waverly Hotel & Convention Center is connected to Cobb Galleria Centre, which has over 2,000 parking spaces. We have been assured by management that Southern-Fried Gameroom attendees will be allowed to park in these adjoining lots at no cost. Again, the earlier you arrive the better. During Braves games, there may be an attendant on duty to dissuade Braves fans from parking in these lots. Should you see an attendant, just tell them you are parking for SFGE and they will allow you to park. Last year, and at other events, people have been able to park in lots adjacent to the Waverly in front of Building 200, 300, & 400 office parks. We have been told that the office buildings will close this lot off a few hours before Braves games start. Should you arrive early in the day, you may be able to park there without penalty or for a fee. However, Southern-Fried Gameroom Expo and Player One, LLC advise visitors to park there at their own risk as we cannot be held liable. We advise you to park in Waverly or Galleria parking. A transit alternative, the Cumberland Circulator provides high-frequency service along convenient, accessible routes in the Cumberland area. 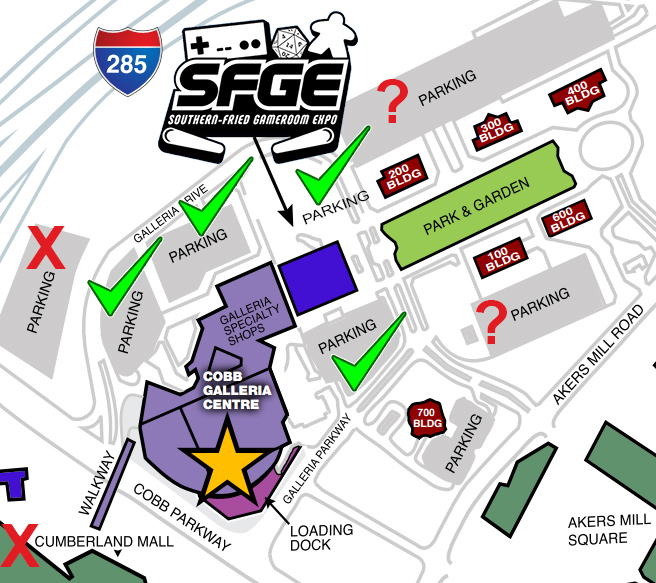 Simply park at the Cumberland Transfer Center behind Cumberland Mall and hop on either the blue or green line for transportation to Cobb Galleria Centre which adjoins the Renaissance Waverly Hotel & Convention Center for SFGE! Southern-Fried Gameroom Expo has partnered with the ridesharing service Lyft to offer first-time Lyft users a unique coupon code for $5.00 off your first ride. 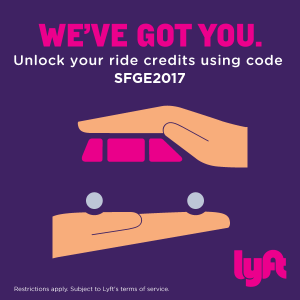 Just download the app and enter the coupon code SFGE2017 and car will pick you up wherever you are. Again, this is only for 1st-time Lyft users. Warning: We do not advise guests to park at the Cumberland Mall as they do not allow event parking and have been known to tow cars. Park there at your own risk.